The Handyman Package turns any shed into a highly functional workshop. One shed is able to pull double duty! On one side, you get a workshop area, closed off by an interior wall and door, that also has its own exterior door. Let the dust fly on this side! On the other side, use as a standard shed for storage, yard equipment, or add more shelving and benches for a larger workshop. 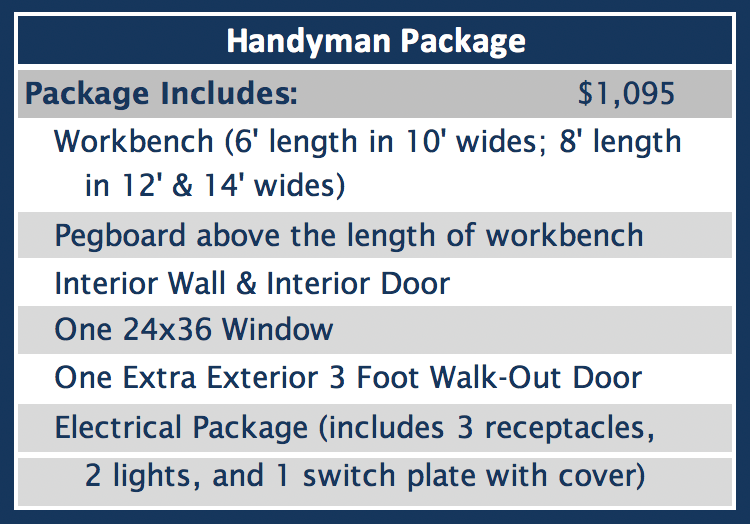 The floor plan shown below illustrates the most popular layout for our Handyman Package with no additional add-ons. Of course, with all our buildings, elements can be customized so placement can be exactly suited to your needs!